Wind Energy Market size for 2016 was valued over USD 70 billion and is predicted to reach over an annual installation of 90 GW by 2024. Growing demand for renewable energy coupled with rising awareness towards environmental conservation will stimulate the global market size. National targets for clean energy along with ongoing depletion of fossil fuel reserves will further propel the industry growth. In 2016, France set its target of renewable energy capacity to 70 GW by 2023 including 23 GW from onshore wind. Declining project development cost subject to fall in component prices favored by government incentives will stimulate the market share. In addition, utility scale installations tend to bear lower operational costs when compared to auxiliary generation technologies. Rapid technological enhancements in line with the integration of smart monitoring and sensing units across turbines have reduced overall system losses. Thereby, economical cost structure in addition to improved efficiencies will positively influence the industry landscape. Horizontal wind energy market is predicted to witness a growth of over 13% by 2024. High efficiency, cost effectiveness and ability to self-start are some of the key parameters which will stimulate the industry landscape. Improved operational performance statistics when compared to its competitive counterparts veritably justify the product penetration. Ability to produce energy in turbulent conditions coupled with low maintenance cost and ease of operation are some of the key features streamlining the vertical axis wind energy market growth. These units are suitable for low rated capacity and residential applications adhered by positive outlook towards distributed wind energy deployments will drive the industry growth. 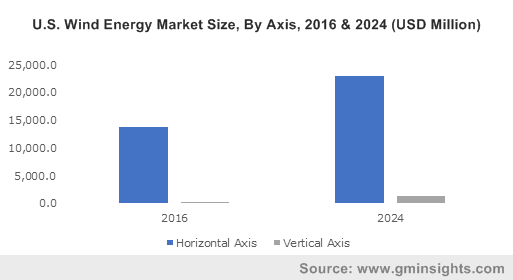 The off-grid wind energy market is set to grow subject to effective economic feasibility across remote areas when compared with grid connected networks. Government incentives toward rural electrification coupled with growing adoption of microgrid networks will further boost the business landscape. Low installation costs along with government incentives including net metering and feed in tariff will positively impact the on-grid wind energy market share. Rapid expansion of utility based electricity networks to cater growing energy demand across suburban areas will further complement the industry growth. Onshore wind energy market is predicted to witness gain of over 13% on account of economical cost structure and low carbon emission when compared to its available alternatives. In 2016, Denmark consumed about 40% of its electricity from wind where 70% of the generation is from onshore turbines. 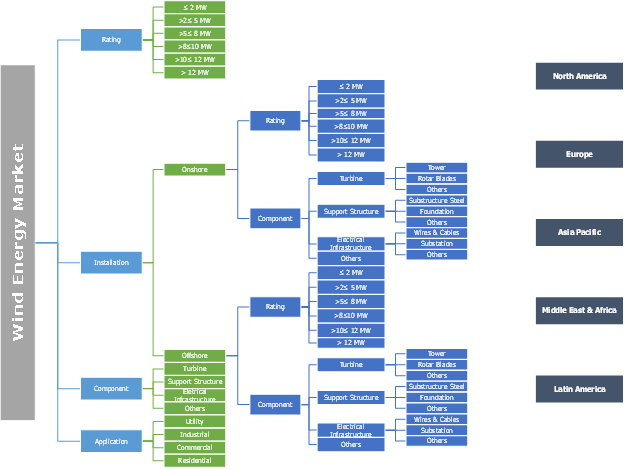 High efficiency, declining offshore project development cost and comparatively less visual pollution are few indispensable parameters which will augment the offshore market growth. As reported by leading agencies, in 2017, UK prices of offshore wind witnessed a decline of 31% in the past four years. Residential & commercial applications in the recent years have witnessed a significant upsurge subject to the rising electricity demand and rapid urbanization across the globe. The deployment of turbines across these applications typically lower the bill by 50% to 90%. Industrial wind energy market is projected to exceed USD 25 billion by 2024. Growing concerns pertaining to the establishment of sustainable energy mix across industries adhered by advancing distributed generation technologies will augment the industry growth. Ongoing industrialization along with rapid expansion of domestic manufacturing facilities across the developing regions will augment the business scenario. Ongoing deployment of systems across residential and commercial applications will boost the demand for 30 kW < 500 kW turbines over the forecast timeline. Urbanization across developed economies along with mass migration across metropolitan areas will complement the industry outlook. Increasing demand for small-scale renewable technologies across commercial establishments coupled with rising need for clean energy mix will further fuel the business growth. The U.S. market size is predicted to surpass 17 GW of annual installation by 2024. Declining component costs, increasing domestic turbine production along with ambitious targets toward capacity addition from renewable will foster the business growth. As per the U.S. Department of Energy, wind energy installations grew by 11% in 2016, constituting over 20% of the new added generation capacity across the nation. Europe market size is predicted to witness growth over 10% owing to favorable directives, energy security initiatives, and decarbonization reforms. The European Union Renewable Energy Directive states the policy for the promotion and production of renewable energy sources across the region. The directive has laid targets to achieve 20% renewable integration in the overall energy mix with wind accounting for over 200 GW installed capacity. Key players in the industry include Vestas, GE, Goldwind, Gamesa, Enercon, Nordex, Envision, Mingyang, Senvion, Alstom, ABO-Wind, NextEra Energy, Invenergy, Geronimo, Tradewind Energy, EDF, Vattenfall, EDP Renewables, ABB, A2 Sea, ReGen. Leading industry players have extensively adopted mergers & acquisition as a prime strategy to expand and sustain their industry presence. In April 2017, Siemens entered the merger of its business with Gamesa to create unrivalled global presence and position in the industry. Wind energy is the cost-effective technology to generate renewable power. Technological advancement in industry has boost the industry size over the past years. Decreasing component price in the last five years has instigated the overall industry growth. Government incentives including tax and feed in tariff for wind technology makes its adoption preferable over other alternates.